Indeed, as anyone who has frequented the various Anglican blogs over the last 9 years can attest, the fights between orthodox Anglicans who consider themselves “Communion Conservatives” and orthodox Anglicans who consider themselves “Federal Conservatives” are often bloodier and more divisive than any between orthodox Anglicans and the revisionist leadership of the Episcopal Church. “Communion Conservatives” sometimes view “Federal Conservatives” as embittered reactionaries who have chosen schism or, conversely, as cowards who retreat from a fight. “Federal Conservatives” often assume that all who remain in the Episcopal Church lack the faith or courage to leave “goods and possessions” behind for Jesus’ sake or view them uniformly as “collaborationists” who by their mere “belonging” facilitate the heresy of Episcopal Church leaders. ‘Federal Conservatives’, in the bottom right, consists of those who are conservative on sexual ethics but who do not consider highly the ecclesiology of the Windsor Report and especially its warnings against transprovincial interventions. They would not be unhappy with the demotion of the Anglican Communion to a Federation of Anglican Churches. ‘Communion Conservatives’, in the top right, consists of those who are conservative on sexual ethics but have a high regard for the ecclesiology and the recommendations of the Windsor Report. They are keen to hold to the concept of Communion. ‘Communion Liberals’, in the top left, consists of those who are liberal on sexual ethics but have a high regard for the ecclesiology set out in the Windsor Report, if not all its recommendations. ‘Federal Liberals’, in the bottom left, consists of those who are liberal on sexual ethics and have a low regard for the ecclesiology set out in the Windsor Report and many of its recommendations. At the time I thought Kings’ quadrant was the best way of thinking about the Anglican universe. I’ve changed my mind for two reasons. First: Notice that in all four categories the real cause of the conflict—the decision of the Episcopal Church to consecrate a non-celibate homosexual man to the office of bishop—is described as a difference of opinion concerning “sexual ethics”; a difference couched in political rather than theological language. Some Anglicans embrace “conservative” sexual ethics. Other Anglicans hold a different opinion and embrace “liberal” sexual ethics. The one writing such a sentence assumes that both the liberal and the conservative are bona fide “Americans” who, while full members of the body politic, significantly disagree over an important but not nation dividing issue. That seems to be the thrust here as well. Liberal “Anglicans” hold one opinion and “Conservative” Anglicans hold another but both sides presumably belong within the category “Anglican” and within the larger category “Christian”. But, as I think subsequent history has made manifest, this is not merely a “conservative” Anglican versus “liberal” Anglican dispute. This is not simply a disagreement among believing fellows over the way the Christian faith is to be practically practiced and applied—Christian ethics. It is rather a conflict that goes to the foundation the Faith itself, calling into question the foundational principle of the Apostolic church—the authority of the apostles and the prophets (Eph 2:12). The Episcopal Church, by actions of its most authoritative legislative bodies, has officially rejected of the authority of the bible with regard to human sexuality. So my first objection to Kings’ quadrant is that it subtly reduces a first tier dispute about essential Christian doctrine to a second tier disagreement over Christian practice. Second, notice that the Communion is the giant sphere around which each of the four Anglican planets revolve. Even the “Federalists” are defined by their relationship to the Communion. Given that Kings and his friends at Fulcrum set themselves within the “Communion conservative” category this is no surprise. But why should anyone else accept their premise that the Communion presently centered in Canterbury is the center of the Anglican universe? To do so allows those of us Kings would label “Federal conservatives” to be defined as people who throw off legitimate order—or as our “liberal” friends might say, “schismatics”. 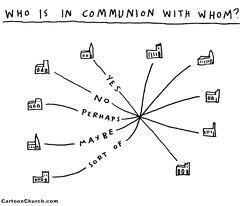 And accepting this conceptualization of Anglican relationships makes for very strange bedfellows. People who reject biblical authority are, conceptually, brought close together with those who submit to it by virtue of their mutual desire for institutional cohesion. One can, within the framework of Kings’ categories, expect an easy, pleasant relationship between orthodox Anglicans who consider themselves “Communion Conservatives” and those who consider themselves “Communion Liberals” since both happily agree about what constitutes the center of the Anglican universe–the Communion–and both embrace the “ecclesiology of the Windsor Report”. So the net effect is that, paradigmatically, those Anglican believers who willingly sit under the authority of scripture and uphold the classic doctrines of the Church are bound together with those, who by their rejection of the same, effectually rip the Christian heart out of the Anglican body. So my second problem with Kings’ paradigm is that by setting the Communion at the center of the Anglican universe, Kings superficially exaggerates the divide between orthodox Anglicans who differ over ecclesiology and superficially unites those who promote a false gospel to those who embrace the true one. The categories not only create grounds for a significant rift within the orthodox camp, they also provide strong incentives for those who wish to remain “truly Anglican” to cooperate peacefully with Communion leaders without regard for their theological commitments (or lack thereof) thereby setting up a rationale for disobedience to the New Testament imperative against providing heretics with aid and comfort (2 John 7-11). I think the broad acceptance by Anglicans of Kings’ paradigm, or at least—recognizing that many have not indeed actually read Kings’ article—broad acceptance of its underlying premises has served to fracture the orthodox Anglican community. This is not to say that there are no embittered reactionary schismatics among those who have departed from the Episcopal Church. Clearly there are. Nor is it to say there are no “collaborationists” among those who remain. Clearly there are. But the truth is that orthodox Anglicans are united at a far deeper and more “primal” level by virtue of the One Faith, One Baptism, and One Lord they, as one Body, profess and serve than they are divided by any ecclesiological difference of opinion or strategic difference of “aim” however significant . Or, to put it perhaps more tritely, what unites us is far Greater than what divides us. We may never be able to be one ecclesial body, but we are One nevertheless in Christ and that oneness should and must be given more significance than any other, more superficial kind of unity. Windsor Report” if such categorization unites sheep to wolves and divides brother from brother? Why shouldn’t there be a Copernican rethinking of the Anglican universe? I believe orthodox Anglicans need a new way to conceptualize the Anglican cosmos that sets revealed truth at the center. Let Jesus Christ and his word be the measure of everything Anglican and the sphere around which everything orbits. And let us find a new paradigm that rejects entirely the false claims and professions of those who deny biblical authority while purporting to be both Christian and Anglican. Cooperating: Those who personally hold to biblical orthodoxy but who in small or significant ways support gospel deniers by their financial offerings, political/legal alliances, and verbal affirmations within the Episcopal Church or other provinces. Resisting: Those who uphold biblical orthodoxy within the present structures of the Communion by refusing to cooperate with or support the policies, actions, and/or words of gospel deniers while, seeking to restore and reform these structures from within. Replanting: Those who uphold biblical orthodoxy by leaving the present structures of the Communion and beginning anew with the aim of proclaiming the gospel and promoting Anglican Christianity without hindrance from gospel denying leaders in the Communion. Reacting: Those who uphold orthodoxy and who leave the Episcopal Church, but whose ministry is subsequently more marked by bitterness toward the Episcopal Church than zeal for the gospel. These categories are not value free. It is not good to “cooperate” or to “react”. And yet “value” is measured by theological rather than by ecclesiological commitments. There is a faithful, honorable and important path for orthodox Christians both within and beyond the present structures of the Communion. This way of categorizing—if broadly accepted—or one like it, could cut the heart out the ongoing and familiar conflict between leavers and stayers. As things stand, “Cooperating” Anglicans tend to lump Replanting Anglicans together with Reacting Anglicans under the label “schismatic”. And “Reacting” Anglicans tend lump those Resisting Anglicans together with those Cooperating as “Collaborators”. That way of thinking sets an ecclesial institution—either the Episcopal Church or the Communion—rather than Jesus Christ and his gospel at the center of the Anglican universe. Reacting Anglicans—those who set institutional unity or anti-institutional vengeance above the gospel–are on the extremes, as they should be. At the center of the Anglican Universe is not an institution, but zeal for the word of God and a willingness to sacrifice all for the gospel. The four categories are designed to be used, primarily, as vehicles for self-reflection conviction and only second as vehicles for externally measuring and judging the actions of others. There have been many times during the last three years when Anne and I have acted out of vengeance—reacting against the Diocese of Central New York rather than replanting Good Shepherd. It’s been helpful at times like that to prayerfully rethink our calling—are we ministers of the gospel or are we on a quest for personal satisfaction in the form of revenge? While we were serving in the Episcopal Church there was, for both of us, a great longing to please our bishop and cooperate with friendly but heterodox colleagues. Any Anglican follower of Jesus can fall into any of these categories depending on his circumstances and strength at the time. This entry was posted on Sunday, October 30th, 2011 at 6:04 am	and is filed under Uncategorized. You can follow any responses to this entry through the RSS 2.0 feed. You can leave a response, or trackback from your own site.